Everyone knows how to work a fire extinguisher, right? While it isn’t difficult, being faced with a fire tends to rattle people, and time is not necessarily your friend. A small fire that could be easily put out can quickly get out of hand if it takes too long to get the fire extinguisher into action. Something that can help, is to simply remember to P.A.S.S. This is an easy-to-remember acronym that stands for pull, aim, squeeze and sweep. You pull the pin, which is the step often forgotten, aim the nozzle at the base of the fire, squeeze the handle and use a sweeping motion to totally extinguish the fire. Fire extinguishers have been around for nearly 200 years. The first known patent for one was in 1723, but it involved using gun powder to explode and distribute the liquid meant put out the fire. This model did not prove wildly popular. 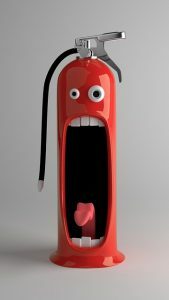 What we consider the first modern fire extinguisher, much like what we use today, was invented in 1818 by British Captain George William Manby. Basically, all fire extinguishers function generally the same: the fire-extinguishing contents are held under pressure until released with the lever or handle. What does differ are the agents used on the fire. They vary depending on the type of fire and either remove the supply of oxygen, reduce the heat or reduce the fuel that is keeping the fire going. There are five types of fire. It is important to know the type of fire in order to choose the correct fire extinguisher. Using the wrong type can be dangerous and make the fire worse or spread it. Class A – normal combustibles such as wood, paper, and cloth. Class B – flammable and combustible liquids and gases, such as gasoline and paints. Class C – electrical fire. Class D – flammable metals, such as sodium, potassium and lithium. Water and Foam – uses water to remove the heat component and foam to reduce the oxygen from the fire. A water extinguisher can be used only on Class A, while foam can be used on A and B. Carbon Dioxide – takes away the oxygen and removes the heat through the cold discharge. Effective on Class B and C fires. Dry Chemical – the multi-purpose Dry Chemical extinguisher is the most popular of all extinguishers because it can be used on Class A, B and C fires. Wet Chemical – used on Class K, cooking-type fires to remove heat and separate oxygen and fuel. Dry Powder – similar to dry chemical extinguishers, separates fuel from oxygen or removes the heat component of a fire. Only used on combustible metal fires, Class D.